It’s always a nice reminder that despite the cold Minnesota weather, there is plenty of plant life just waiting to burst forth come spring. Besides being such a reminder, evergreens also provide interesting structural and foliar contrast in the garden year-round. 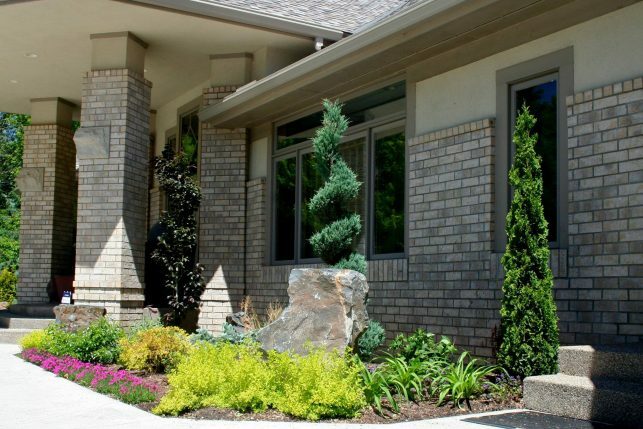 There are enough varieties of evergreen that the landscape uses are endless, including groundcover, hedge, focal specimen, accent plant and shade tree. They range in height from a few inches to over 50 feet. They can be golden, blue, reddish, and of course green, and come in a wide variety of shapes. There are few gardens that aren’t improved by a well-selected evergreen. Here are some tips for purchasing, planting and caring for your evergreens. Many Minnesota evergreens are fairly slow-growing, especially when young, and therefore can be rather pricey. Be sure to choose one that is hardy in your growing area. Before buying an evergreen, know where you are going to put it, and that it will have space to grow. This includes its roots, since they need room to spread with minimal disturbance in order to maintain a healthy plant. With the exception of arborvitae (which can tolerate wetter areas), evergreens like well-drained soil. Most like sunny spots, although yews and hemlock tolerate shade and may even burn in hot afternoon sun. Look for plants that don’t have sap running down the trunk or brown needles. Brown needles will never turn green, and they can be a sign of drought stress or disease. Apart from timing, evergreens in Minnesota can be planted just like other trees and shrubs, but it should be done in spring, summer or early fall. They can’t be planted as late in the season as many deciduous species because they need time to develop a good root system before winter. Water once a week during the first year, and more often in hot, dry weather. Avoid over-watering. Placement of the plant can be important. Evergreens that are near the edge of their zone can be especially susceptible to harsh winters, but sometime the site can ameliorate the effects. If possible, avoid growing them where they are exposed to drying winds and afternoon sun, such as on the westerns side or corner of a house. If the temperature drops suddenly when the sun sets or goes behind another structure, it can stress the plant and cause winter burn and/or tip kill. Some varieties are less susceptible than others. Even once established, they need to be well-hydrated before winter since they don’t enter dormancy as deciduous plants do, and should be watered in the late fall right up until the ground freezes. A layer of organic mulch will help preserve soil moisture and prevent weed growth. As with all trees and shrubs, avoid having the mulch contact trunk or stems. Landscape fabric is not recommended. A high nitrogen fertilizer can be applied in spring and fall, though mature trees will rarely need it. While evergreens can be pruned, it is not usually necessary, and if they are it isn’t easy to preserve their natural shape and beauty when doing so; they don’t readily sprout from cut branches the way deciduous plants do; avoid leaving holes in the structure, as they may take years to fill in. If you do decide to prune to limit size or if you want a more formal look, it’s best to do it every year, usually before the spring flush of growth, though this can vary somewhat with species.